Data Attribute, Slime-type. This tiny, shy digimon is said to only be born under moonlight. Those who are born under a full moon gain the power of lunar magic, making them stronger than normal, and allowing them to digivolve into more forms. Data Attribute, Lesser-type. This nocturnal digimon is rarely seen, and uses its speed to avoid capture. It may be lured, however, by its favorite food -- fried tofu. Data Attribute, Beast Man/Animal-type. A bipedal fox digimon that uses her speed and calm judgement to win battles. 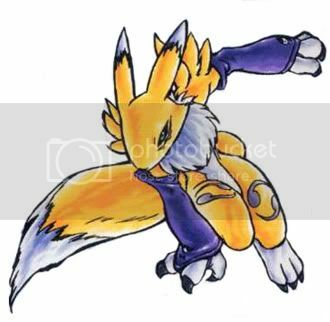 A very intelligent digimon, Renamon is taller and a bit stronger than the typical Rookie-level digimon. Data Attribute, Bewitching Beast/Mythical Animal-type. 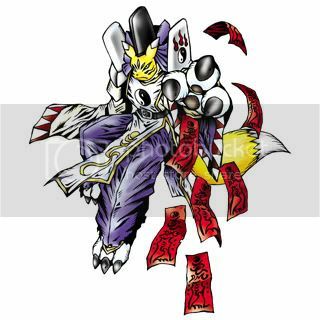 This powerful, experienced species of digimon is based after the legendary 九尾の狐 "Kyubi no Kitsune" / Nine-Tailed Fox (of course!!). She may have been seen as a messenger of peace in ancient times. A Virus-hunting version of Kyubimon, she is described as having silver fur and crimson flames. A malicious version of Kyubimon that brings destruction. It can manifest fireballs (Homuradama) and draconic fire (Jaenryū) from its red flames, and manipulate them to destroy its enemies. Although it is not as physically strong as its benevolent counterpart, Youkomon has great magical power and is said to run through the skies with its blazing legs. Data Attribute, Demon Man/Wizard-type. An onmyouji digimon that uses Yin & Yang magic, along with powerful talismans, mantras, and spells, to destroy its opponents. Additionally, it can summon Shikigami to assist it. Under its long sleeves and robes, it has been known to conceal a myriad of weapons. Like all its previous evolutions, Taomon is nocturnal, and prefers to use its wisdom of battle under cover of darkness. A silver-colored Virus-hunter, similar to Kyubimon!Vaccine. The evolution of Youkomon. Unlike Taomon, this version specializes in curses of death and is known for being an assassin. Its attacks are Demonic Gates (鬼門遁甲 Kimontonkou) and Exorcism Scrolls (呪禁札 Jugonsatsu). This powerful and beautiful Digimon is a miko, a shamanic being. She is an adept user of Ying & Yang magic and can even call upon God Beast Digimon. The staff she holds can create a defensive barrier around herself, as well as purify evil spirits. In the four containers on her waist dwell four kudagitsune (tube-foxes), which can be used for any task from attacking to reconnaissance. Each spirit has a different color, and each one's forehead has a symbol, corresponding to the respective elemental power they possess – Fire (火 Hi, Red), Water (水 Mizu, Blue), Wind (風 Kaze, Green), or Thunder (雷 Kaminari, Yellow). In this mode of Sakuyamon, she takes on the appearance of a Shinto priestess and can perform divine rituals. Data Attribute, God Man-type. 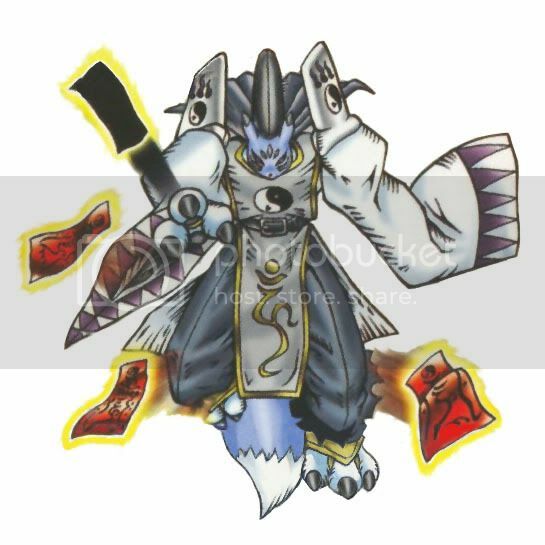 Kuzuhamon is a user of ancient Shinto magic, and evolves from fox digimon who have lived a long life. Only very powerful and experienced ones can evolve into Sakuyamon, so many end up becoming this digimon. She possesses only one tube-fox on her waist, and it is a spirit of a silvery-white colour. 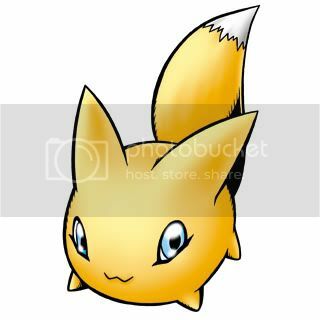 Kuzuhamon's name is derived from a white fox from Japanese folklore, Kuzunoha. Her attacks are Womb Realm Mandala (胎蔵界曼荼羅 Taizoukai Mandala) and Reverse Izuna (裏飯綱 Ura Izuna).